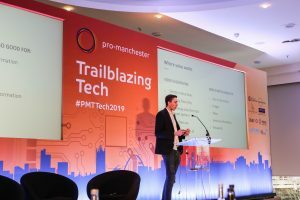 Our Trailblazing Tech conference took place at The Lowry Hotel recently, welcoming over 200 of Manchester’s most inquisitive minds to learn more about our fast-growing tech sector. 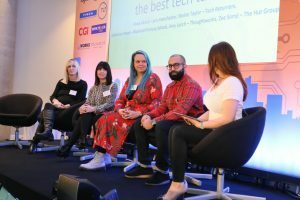 Tech talent is a huge discussion point, particularly in Manchester, with more businesses moving here, all fighting for the same talent in the region. It is believed there will be 800,000 unfilled technology roles in the UK by 2020, an astonishing figure that comes as no shock when last year, the tech sector expanded 2.6 times faster than the rest of the UK economy. In Manchester alone, over 62,000 digital jobs were created in the last 12 months, with nearly 900 tech start-up births too – we aren’t short of excellent job opportunities, but how can businesses retain their excellent talent, when there are so many roles to choose from? Zee Somji, people programme manager at The Hut Group explains that they are recruiting and upskilling from within: “We are moving people into new areas at present. Often people’s skills are transferrable. For this reason, we’ve brought in accelerator courses to push people into software engineering as there really is a shortage of tech talent. Diversity is also something required in technical roles. Amy Lynch, head of diversity and inclusion at ThoughtWorks: “It takes relentless dedication to make sure you’re creating a diverse organisation. We are ensuring we are being inclusive of diverse people. When creating our workspace, we spoke with our team about what they needed, and things we hadn’t even thought of cropped up. “For example, we have a reflection room now – this is used for those who may be on the spectrum to have some quiet time, for people to meditate, to pray and we also have mothers in there who express milk privately. “We don’t have a ball pool, a slide or a football table, we have things that people wanted. This can relate back to tech. You can’t make tech that you want a diverse range of people to use if you just have middle-aged white men making it. Voice recognition specialists, Apadmi discussed the growing revolution of voice technology. Amazon has reported that there was an incredible 50 billion voice searches each month in 2018, with this set to grow to 200 billion by the end of next year. So, what is voice good and bad for? Caroline Canty, communications manager and Pat Cavanagh at Apadmi outlined the pros and cons. One of the cons of this fast-growing tech being security. It is not safe to say your passwords or pins out loud in public spaces for example, so this is something that needs to be thought about if companies like Amazon want us to use the Echo to transfer funds. Cyber security is a huge issue for businesses in the ever-changing world of technology. As technology improves, there is more crime happening every day online. A representative from the National Security Centre joined us to give attendees advice. We were delighted to see the national centre at our conference and are equally delighted that GCHQ has chosen Manchester as its newest location for offices. “Most cyber attacks aren’t personal attacks. They are exposed vulnerabilities that general attacks have managed to break through, and businesses such as the NHS are unfortunately the victims. These attacks have huge repercussions, so ensuring you are as safe as possible is of paramount importance,” says the deputy director for cyber skills and growth. Holly Grace Williams, principle consultant at cyber security firm, Secarma blew the minds of delegates with her live demonstration of hacking techniques. As a mere comms manager, I couldn’t possibly attempt to try and tell you the ins and outs of how Holly does her incredibly interesting job, but her live demonstration of cross-site scripting showed our delegates how she ethically hacked into one of the country’s most successful gambling sites, exposing its 7 million users’ credit card information. The live demonstration showed just how vulnerable even the largest organisations are online. How important is the perfect blend between automation and human interaction? As tech begins to take control of our lives, Garry Prior, director of product at The Hut Group discussed the importance of the perfect blend between automation and human interaction. As one of the country’s largest online retailers, automation is a key part of The Hut Group’s marketing strategy; whether this is informing a customer of other products they may like based on their purchases, or The Hut Group’s seamless delivery process, automation is important for any successful online retailer. Is there a human need for reassurance or certainty? Is there a strong need for active input? Is there a need for flexibility or a high probability of change? Is there a usability gap? Following this, James Touzel, head of digital and innovation partner at TLT, Sam Barton, head of customer experience at OpenMoney, and Mark Madden, digital transformation director at CGI joined Garry on stage in a panel hosted by our tech sector co-chair, Mark Robinson, insurance broker at Finch Insurance to discuss whether automation could be personal. James Touzel explains that TLT has introduced tech, while still ensuring their customer feels assured there is a ‘real person’ dealing with their requests. “We’ve thought a lot about the balance between tech and humans. Tech allows us to provide efficiency for clients, but they still have the reassurance of picking up the phone and talking to us,” James explained. Sam Barton believes tech allows the consumer to make a more informed decision before speaking with them – saving them as a business and the consumer time: “For us, we have created a level of technology that allows our potential customers to make an informed decision before deciding if they actually want to speak with someone. How is technology shaking up the manufacturing industry? The definitive nature of technology is creating worry among skilled workers in sectors such as manufacturing. Our Industry 4.0 panel, featuring David Moss, digital programme manager at Siemens R&D, Aine McTiernan, PwC scale north lead and Nikolay Mehandjiev, Professor of enterprise information systems, Alliance Manchester Business school and hosted by our chief executive Sam Booth discussed how technology is impacting the manufacturing sector. Siemens R&D is working hard to develop the technology in their factories to improve the lives of their employees, rather than replace them: “The challenge we and others are facing is to upskill our current employees who have been very loyal to us who don’t know new technologies,” says David Moss. David continued: “When you walk onto the factory floor and you see robots working you think ‘this is cool’, but we have a pledge that no job will be lost to robots. Nikolay adds: “Are we going to start treating AI as some bizarre thing that’s coming here and stealing our jobs like a mistreated immigrant? No. Salford University is currently trialling the idea of replacing bus drivers with autonomous vehicles. While this service will still require a person to choose which course the bus will take, driving is no longer a requirement. Paul Knight, partner at Mills & Reeve welcomed the firm’s client, Salford University to the stage alongside him to discuss how project manager, Joe Flanagan had been upskilled from business development manager to project manager of the university’s autonomous shuttle bus. While technology goes at a rapid pace, it was interesting to hear from Paul how the law is sometimes detrimental to the growth of exciting tech. A great example of this is the ongoing battle Salford University is having with the DVLA to get their autonomous vehicle a registration plate, so it is able to access the local A road that connects the university’s campuses. In order for a vehicle to be road worthy, it must have a valid MOT. Part of the MOT test is to push and pull the steering wheel and handlebar to check it’s properly secure – tricky to do if there’s no steering wheel on the shuttle, as you can imagine. An interesting look at technology, as a fast-growing sector, it’s extremely difficult to keep regulations up to scratch and relevant. 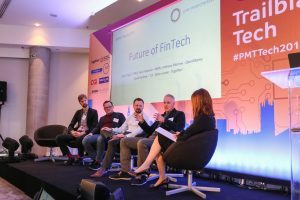 Anthony Morrow, founder of OpenMoney discussed this in our FinTech panel, hosted by Yorkshire Bank’s Helen Page and featuring Simon Carter, Together; David Gardner, TLT and Niels Pederson, Manchester Metropolitan University. “Regulation is really important, especially in FinTech, because it helps build up trust with the consumer. Trust is really important when it comes to finance. Regulation helps with this trust, but it is massively lagging behind in comparison to how tech is evolving,” says Anthony. There was so much information to take in throughout the whole day, so much so that I could go on for another two blogs – I won’t, don’t worry. It was great to hear how Manchester is shaping the wider-UK’s technology sector and to hear from so many interesting individuals who are innovating in our region. The feedback we’ve had so far has been really encouraging, and once again The Lowry Hotel helped the event to go without a hitch. We’d like to thank our sponsors, without whom we aren’t able to put on events like this: B Works powered by Yorkshire Bank, Together, Alliance Manchester Business School, The University of Manchester, Manchester Metropolitan University, Finch, TLT, OpenMoney, Mills & Reeve, Business Growth Hub, CGI, HSBC, Head Resourcing, Latitude Studios and Vision Events. Photos from the day, taken by Paul Kyte can be found on our Facebook page here.